BendPak offers a wide range of durable two-post lifts with lifting capacities ranging from 9,000 pounds to 18,000 pounds. Their car and truck lifts are designed to handle any of your vehicle lifting requirements. The Clearfloor models provide unobstructed floor space allowing technicians to easily move toolboxes, transmission jacks, oil drains and other automotive equipment underneath the elevated vehicle. For those who have shops with a low ceiling or lifting high-profile trucks and vans, may want to opt for the XPR 2-Post Floorplate models, purposefully designed to be clear of overhead obstructions for increased headroom. The unique XPR 2-Post Asymmetrical models offer the convenience of being able to open a vehicle's doors while it's still on the lift. Most BendPak two-post lifts come in medium, heavy and super-duty capacities, so you'll easily find the right lift for the job. Want to compare brands? Click here to see all our 2 Post Lifts. And for even more information, check out our In-Depth Lift Comparison and Car Lift Safety Features articles. When you need to lift something heavy—really heavy—your best bet is always BendPak. Our super-duty models are pure brutish muscle. This XPR-12CL, for instance, has an astounding 12,000-lb. capacity and features heavier column construction, carriage construction and frame components than ever before. Looking for the direct-drive operation of the XPR-9FD, but with an even beefier lifting capacity? Then, the XPR-12FD is your car hoist. This super-industrial-strength piece of equipment has got it all: cutting-edge technology, top of the line materials, design that's ahead of its time and a 12,000 pound lifting capacity. When you need to lift something heavy—really heavy—your best bet is always BendPak. Our super-duty models are pure brutish muscle. This XPR-12CL-192, for instance, has an astounding 12,000-lb. capacity and features heavier column construction, carriage construction and frame components than ever before. 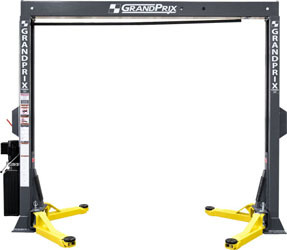 Max Lifting Height (6" Adapter): 80"
When you need to lift something heavy—really heavy—your best bet is always BendPak. Our super-duty models are pure brutish muscle. This XPR-15Cl, for instance, has an astounding 15,000-lb. capacity and features heavier column construction, carriage construction and frame components than ever before. 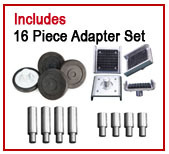 Max Lifting Height (5" Adapter): 79"
When you need to lift something heavy—really heavy—your best bet is always BendPak. Our super-duty models are pure brutish muscle. This XPR-15CL-192, for instance, has an astounding 15,000-lb. capacity and features heavier column construction, carriage construction and frame components than ever before. When you need to lift something heavy—really heavy—your best bet is always BendPak. Our super-duty models are pure brutish muscle. This XPR-18C, for instance, has an astounding 18,000-lb. capacity and features heavier column construction, carriage construction and frame components than ever before. The BendPak XPR-18CL-192 future-proofs your business. Get the same exceptional direct-drive lifting performance, clearfloor convenience and super-duty maximum capacity as with the standard XPR-18CL-192, but with an added 24" up top. Make sure your business can specialize in taller, "Sprinter" delivery, service and transportation vehicles before it’s too late.